Canada Thistle (creeping thistle) Asteraceae (=Compositae), the aster family. BACKGROUND: Canada thistle is an invader from Eurasia. It was introduced to Canada probably as a crop seed contaminate before 1800. It is an aggressive weed that spreads both by seed and extensive root systems. The deep roots grow horizontally and sent up shoots along their length, forming dense colonies. DESCRIPTION: Canada thistle is a perennial plant up to 5 feet tall. Leaves are wavy margined to lobed, up to 6 inches long, and armed with yellowish spines. Stems are single, branched near the top, ridged, and hollow. Flower heads bloom in midsummer, 1/2 inch in diameter, and are not particularly spiny. Flowers are purple to lavender, occasionally white, with male and female flowers borne on separate plants. Seeds are slender, tan, 1/8 inch long, and bear fine plumes. 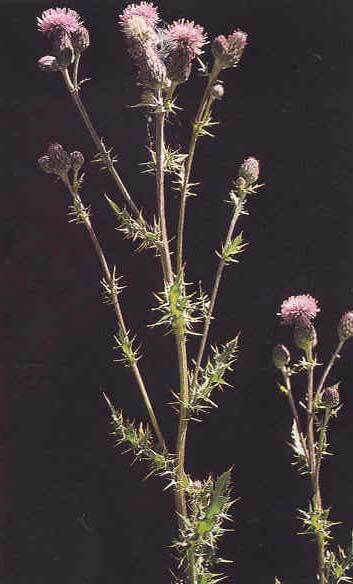 DISTRIBUTION: Canada thistle is found in the northern U.S. and southern Canada. It is one of Idaho’s most widespread and damaging noxious weeds. CONTROL: Biological control agents are available, but control in only poor to fair. Herbicides are available that can control the weed if consistently used.